Mods 101: Gear Customisation in SWTOR. This is the third in a series of game guides I’ll be writing for Crew Skills, discussing various systems of game mechanics to help everyone get up to speed nice and fast. If you have any questions, please feel free to ask! “Exceptional” gear is created when you get a critical success on a normal crafting schematic. The item name will say (Exceptional) at the end, and it will have one open mod slot: the Augment slot. If the crafting schematic was for a moddable piece of gear, the Augment slot will be in addition to whatever would normally be there. Exceptional gear is the same quality as the base schematic, just slightly better because of the Augment slot. “Custom” gear is fully moddable. It usually doesn’t have any stats built-in; it’s a blank slate for you to customise with the stats you want. When it’s modded, it’s usually equivalent to Prototype (ie blue) quality, and will often show up as a Prototype item when looted from bosses. Properly, its designation is actually “Custom”, with an orange loot colour. Custom items come from quest rewards, crafting, social vendors, and so on. Custom gear will usually have slots for Mods, Enhancements, and a type-specific slot (Armoring for armor, Barrels or Hilts for weapons). In addition, weapons also have a Crystal slot for a color crystal which affects the blade colour of lightsabers and the energy bolt colour of blaster weapons; you can buy colour crystals from vendors, but Artificers make colour crystals with stat boosts as well. Other moddable gear also exists; it may have some of the mod slots open, but usually not all of them, and will also have some stats baked in as well. So far I’ve seen this mostly in the form of random artifact-quality BoE armor drops; I’ll add more details as I learn about other examples. Augments come from Slicing missions, and go into the Augment slot of critical-crafted gear. 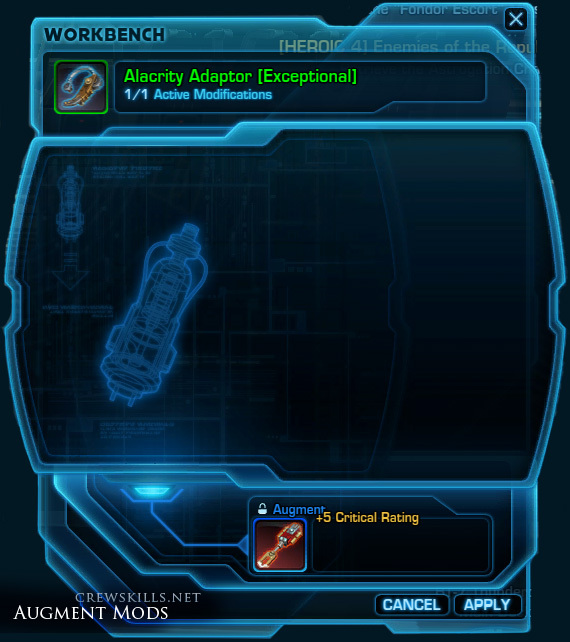 Augments give a single primary or secondary stat. Examples: Might Augment 4, Advanced Alacrity Augment 25. 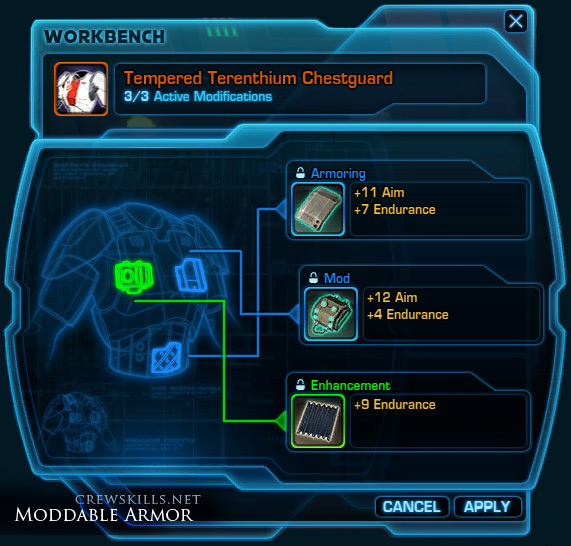 Mods are crafted by Cybertech, and go into the Mod slot of custom gear. Early mods give a primary stat plus Endurance; more advanced/higher-level mods also give a secondary stat. Examples: Reflex Mod 2, Advanced Agile Mod 25. 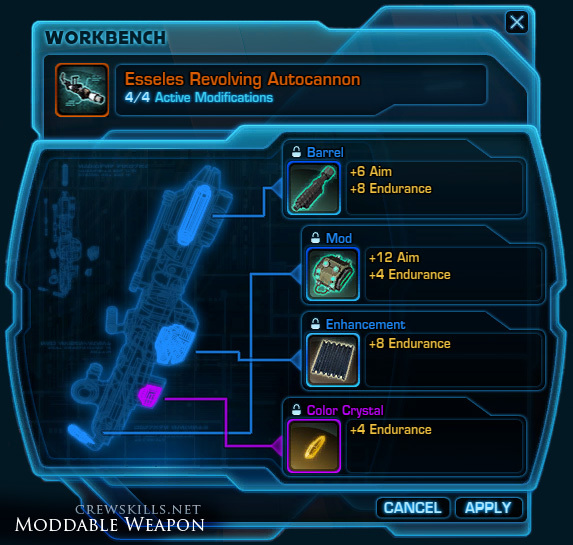 Enhancements are crafted by Artifice, and go into the Enhancement slot of custom gear. Enhancements give Endurance and one or more secondary stats. Examples: Fervor Enhancement 6, Advanced Acute Enhancement 25. Crystals are crafted by Artifice, and can be added to weapons only. They give Endurance, Critical Rating or Power. Examples: Yellow Sharp Crystal, Advanced Cyan Eviscerating Crystal. Armoring is crafted by Cybertech, and can only be added to armor, not weapons. (Which is logical.) Armoring gives Endurance and a primary stat; some Armorings also give Expertise, which is a PvP stat. Examples: Reflex Armoring 3, Advanced Commando Armoring 25. Note that the Armoring mod also dictates the overall Item Rating of the armor, from which it gets its Armor value. Barrels are crafted by Armstech, and can only be added to blaster weapons: blaster pistols, blaster rifles, assault cannons, and sniper rifles. They give Endurance and a primary stat – and as with Armoring for armor pieces, the Barrel dictates the overall Item Rating of the weapon, from which it gets its damage range/DPS value. Examples: Skill Barrel 2, Advanced Commando Barrel 25. Hilts are crafted by Artifice, and are the Force-users version of Barrels. They can only be added to lightsabers (both single- and double-bladed). They give Endurance and a primary stat, and also dictate the weapon’s Item Rating and thus damage range/DPS value. Examples: Resolve Hilt 1, Advanced Force Wielder Hilt 25. First of all, it’s important to know that when you’re dealing with Custom items in particular, the only thing that affects the item’s overall stats are the mods you install. There’s no difference between a level 10 custom lightsaber and a level 30 custom lightsaber if you put the same mods into both. Choosing between custom items boils down to a stylistic choice: what do you want to look like? This isn’t true, on the other hand, of other moddable items – they’ll have at least some stats ‘baked in’, and the mods are an additional boost to the stats. To add mods to a piece of moddable gear, control-right click it, and the interface will appear. You can drag mods into the appropriate slots, and then hit “Apply” to apply your changes. If you drag a new mod into a slot with a mod already in it, you’ll get a warning that this will destroy the item already in that slot if you continue. You can remove the existing mod from the slot first, by dragging it out to your inventory – this will cost you a fee based on the level and quality of the mod, but will let you save the mod to reuse in another piece of gear later. Note that there are Item Modification Stations dotted around various settlements in the galaxy, and in earlier builds of the beta they used to be necessary for adding or removing mods from your gear, and many guides (and beta players) will tell you you need to go to them to mod your gear. However, this is no longer the case; you now can change the mods from anywhere you like. I’m going to link on over here from our guild wiki. Thanks for the informative post! Very nice write up. Thanks a lot, a clear explanation. Does anyone know if you can get a “crit” when making an orange moddable item, thereby making it exceptional and getting an additional augment slot on top of the normal slots? I’ve never seen it happen but can’t say for sure it can’t. Yes! I have done it with synthweaving. Even on “lower level” Orange (Custom) gear you can crit and get an augment slot. I’ve done it for gloves, waistbands, legs, and chest pieces so far. Liar. synthweaving have only Chest,Legs,Head. And only at cap. Personal attacks are not appreciated; please refrain from calling other commenters “liars” – or anything else. If you’re referring to the craftable custom items, I think you’ll find that the other items come from schematic drops – and they’re not only at cap; I have several low-level custom items made by a synthweaver friend on one of my characters. Siha is correct. I’m a Synthweaver on my main, and there are orange chest & legs at 11 and 15, then chest, legs, & head every 4 levels, ending with 50. How do you get purple augments? Are they only from epic slicing mission items? I’m fairly sure I’ve had purple augments come from crit successes on regular slicing missions, too, but I haven’t been tracking it closely so I can’t guarantee it. Purple augments are random from slicing missions, most likely due to a crit success. I’ve gotten them alone, as well as with cred cases and skill missions. Quick question.. are the gears (the ones that you can mod) the same at different levels? a gear dropped last nite and i put in my mods on it and it does have the same stats?? can anyone confirm this.. awesome work btw! Yep, if you have two pieces of custom (moddable) gear and you put identical mods into them, the gear will have identical stats. The only difference is in armor — if one piece of gear is heavy armor and one is light, with the same mods applied the heavy armor will naturally have a higher armor value. Has anyone found/made a list of which mod goes best for which class, (Resolve = Jedi Consular Sage, Force = Jedi Consular Shadow, etc)? I think it’s fairly straightforward — each class has one preferred base stat, and for each base stat there’s a high-stat Armoring/Hilt/Barrel (for DPS and healers), a high-Endurance Armoring (for tanks), and two mods (one with Crit and one with Power). I think it’s a mistake to assume that all Shadows (or all Guardians, or Vanguards) will want the high-Endurance version of the armoring/hilt/barrel — tanks certainly will, but DPS are more likely to want the high-stat version of the modification. I get the primary stat bonus for class types, but what I don’t understand are the other ability bonuses. What do power, absorbtion, etc. do? And do all ability bonuses (except expertise) work when equipped on companion gear, or is it only primary stat (aim, strength, etc.) and End that work on comp gear? If anyone can explain this to me (or point me in a helpful direction), I would be eternally grateful. I have a toon who has the cybertech crafting ability. I always see from the mod vendors or commendation vendors The “Guardian mod” and the “Commando mod” I can buy them of course but cannot reverse engineer them to learn them even though i have the requisite skill level. Also i cannot buy them ability to craft them from my crew skills trainer. Does anyone know where I can learn to make these? You don’t. This post is about mods that go in your gear, not software mods like addons. SWTOR doesn’t support addons or software mods. Is there a guide line for comparing ‘green’ level mods with ‘blue’ and ‘purple’ level mods? For example, if a purple is one or two levels below a green, how do you know which one to choose?